Brioche in Savannah--Field Trip Fun! 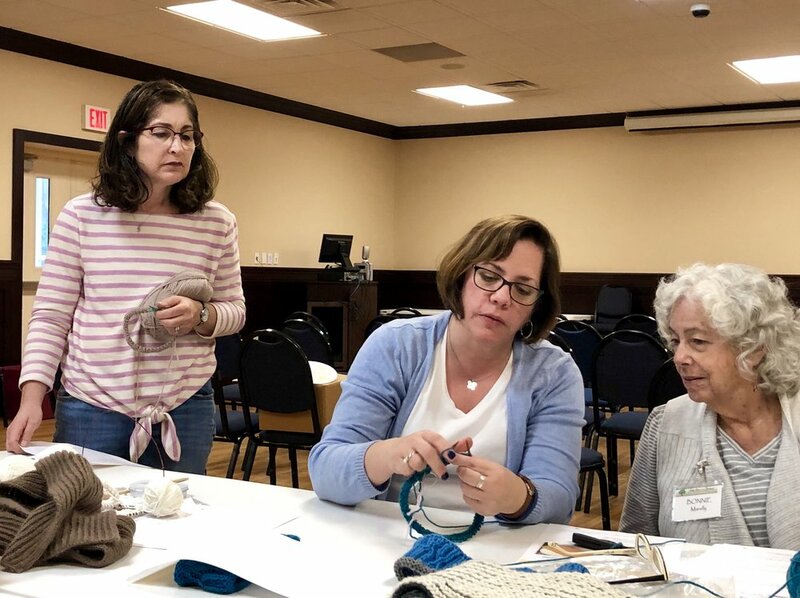 On Saturday, April 6, I was the lucky guest of the Fiber Guild of the Savannahs. I was able to talk a bit about KnitOasis (aka my biz) with guild members. They asked great questions afterward and there’s nothing that makes a designer feel good about her patterns like having to tell everyone exactly which ones she has brought to show (Reversible Cable Wrap, Dagney Hat, Carousel Hat, Coosaw Cowl, Swirls and Stripes Tote, Aunt Dahlia, Charleston Indigo Scarf, Diamond Ringlet Socks). Then I taught a brave bunch of knitters how to do some Brioche. They were very determined and patient and I can’t wait to see how their projects turn out. Brioche is one of my top-requested techniques classes, and it’s one of the hardest techniques I teach! The guild has a studio at the Oatland Island Wildlife Center, filled with looms, spinning wheels, books and supplies. Every year they work with the Oatland Island folks when the sheep need shearing, giving them the softest wool to spin and weave. It was truly a pleasure to be invited to share the day with these incredibly gifted artists! Special thanks to my friend Wendy from Spinsjal for setting it up! I'm not like Jeanette. Jeanette is sweet and funny and talented (OK, so I'm a little like Jeanette). Jeanette, however, loves to knit lace. While I don't hate it, I'm not quite to the "love" stage. I do it, I am even designing a simple lace wrap, the test-knitting of which is very instructive, and even, dare I say it: fun. Now, since I'm not like Jeanette, this pattern will not be on the same level of lace (read: pro) as her lace patterns. This is the kind of thing Jeanette designs: Seabrook on Ravelry. She designs lace for people like her who are not afraid of lace and/or love it. I design lace for rank amateurs and those who struggle with paying sufficient attention to the project to keep from screwing it up. Like my mother used to say, It takes all kinds. When you realize that she overcame the effects of a childhood case of polio to go on to on to be the first American woman to win 3 gold medals in track & field in one Olympic games, that quote takes on a whole new light, doesn't it? While my own struggles with complicated knitting techniques are literally nothing like her struggle to achieve her goals, I am inspired to embrace that part of my character that very stubbornly does not quit. I tell my students all the time, especially the beginners, keep at it. You're bigger than those sticks and that yarn. Don't let them get the better of you. Because really, how sad would it be to give up on mastering a knitting technique with Wilma Rudolph as your role model? I've had good times with lace knitting and times that weren't so good. There was the lace shrug for my daughter's prom that ended up just being stockinette stitch, for example. There was also that enormous lace blanket that I knit, so I know I'm not beaten. Perseverance then is the name of the game. Another word for perseverance is "Lifeline." (OK, I may have made that up) If you're going to make anything of yourself as a knitter of lace (or at least conquer the fear or master the technique, as the case may be), you're going to HAVE to run a Lifeline. I know it takes valuable knitting time to do it. Trust me, I understand--some days my knitting time is scarce as hen's teeth (as grandmother used to say) (you're picturing a chicken now, aren't you, trying to remember if they have teeth) (disturbing imagery isn't it?). Take that extra time now to save yourself the heartache of having to start over from the beginning. If you don't know how to use a Lifeline, do not knit any lace until you go to KnittingHelp.com and watch this video. Write down the number of the row on which you put your Lifeline. Use a thread or a yarn that is the same size or smaller than the one with which you are knitting. Try to find something slippery (aka not mohair) because ideally you will thread that yarn through your stitches and never have to use it to save your project. Ideally you will just pull it back out and thread it through again further up on your project. Even if you never use it to prevent chaos, it's got to come back out again sometime. Make sure you have the correct number of stitches knit on that row (because if you have missed a YO, you will hate yourself). Don't put the Lifeline through the stitch markers if the stitch markers do not open. Don't ask me how I know this. Move your Lifeline every few rows. If your Lifeline is on Row 3 and you make a mistake on Row 26, you might need expensive therapy. Totally preventable. Put a Lifeline on a "rest" row. The project I'm working on now has a row of lace stitches, followed by a row of just knits and purls. This wrong side row is where my Lifeline goes and I run it after having completed this magic row. Also, lace knitting and lap cats are not always a happy combination. Persevere. Put in your Lifeline. Conquer lace. You can do this. Sometimes I use two Lifelines. Don't judge. Red Scarves (finally) on their way! I did it! I finally mailed off the scarves that had been waiting to go to the Red Scarf Project for the last 3 years. With all that has happened here at KnitOasis HQ the last few Autumns, I’m cutting myself the slack I think I need to be able to just BE HAPPY ABOUT IT and not beat myself up over how LONG it took me to box them up. Hi Tamara! My name is Mary Ellen Graham and I live in Upstate NY. I saw on the internet about the Red Scarf Project for Foster kids. Love it! My daughter and her husband have fostered children for many years. They were even fortunate to be able to adopt one that they had received at 8 days old. This project caught my interest. Last year ( Oct. 2017) I joined a group of women who wanted to learn to knit. We have a great person who was willing to share with us her talent and love of knitting. When I saw your project, I decided to do it and I shared the info with the women in my group. Everyone jumped on the band wagon! We have knitted and I have collected about 12 scarves. Some followed your pattern. Others wanted to do their own thing. I hope they will be acceptable. They are all redscarves. Our group has all levels of knitters. We all just love the cause and wanted to help out. Aren’t you inspired? Want to join in as well? My most recent design for the project is the Sandy Scarf, available through Ravelry. And to celebrate my getting my box mailed (! ), from now till Dec. 15 (the deadline for sending in more scarves this year) you can get the pattern for half price! I first met Wendy when she came to one of my Indigo Dye workshops several years ago. We connected on social media like the good Knit Bloggers we are and even met up at SAFF once or twice. Her adventures with knitting and dyeing and more take her all over the world. Why do knitters like creating shawls so much? 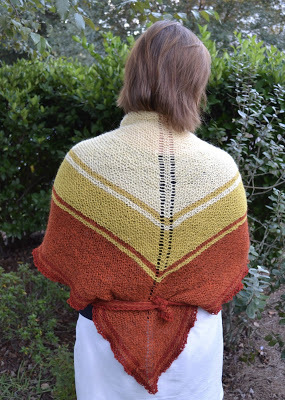 Speaking for myself, knitting a flat shawl provides opportunity…I can explore color, drape, pattern, gauge and different fiber types without fear of creating a garment that won’t fit! If it is too small to fully cover my shoulders and torso, I can use it as a beautiful scarf. If I am less than fond of the end product, I can “gift” it so someone who will appreciate its handmade goodness, and perhaps the color would look better on someone other than myself! I am also intrigued by the history of the shawl, particularly those worn by working women, and the basic wooly warmth that they provided. Shawls and wraps come in various shapes, however the one that I keep returning to is the triangular shawl. This shawl is wrapped around the body and the ends tied in back, leaving the arms free for work and no loose fabric in the front to get in one’s way. For some reason, these have become known in the knitting world as “Danish Tie Shawls” although from my reading and explorations, these shawls appear in many different cultures in Northern Europe and elsewhere. In Copenhagen, there is a famous statue (in addition to the Little Mermaid! 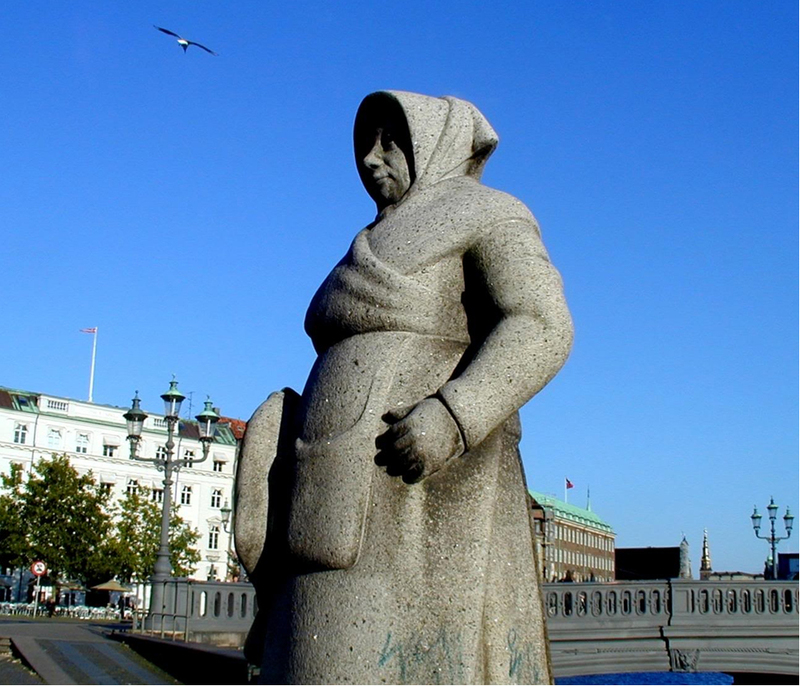 ), that is of the Fishwife from Skovshoved, a fishing village north of Copenhagen. The fish market used to be located on a windy cold harbor and sellers would really bundle up. The Fishwife would be outside all day selling, after walking or taking a cart to the market, and then get home, all out of doors. You can see her tie shawl keeping her warm in this photo. I do wonder whether the origin of the shawl’s name comes from this statue! A basic triangular shawl is very easy to create, and great for beginner knitters. It should be noted that it is not a triangle per se, due to the increases the hypotenuse of the triangle curves up. Here is one that I knit for a doll. These shawls can be knit small or large. You may wish to knit a small one to use as a scarf or neck warmer, or a full sized one to wear in the traditional way. You may use any yarn in any fiber and gauge that gives you the drape that you want. Stripes are easily incorporated into the pattern. Yardage depends on the size and your gauge. If you are doing a full sized Tie Shawl in a dk weight you will probably need 700 yards at 5 stitches per inch. You will want to have a generous amount of yarn on hand. OR be spontaneous….if you wish, you can just start knitting with the yarn that you like and see how far you get! The pattern is easy; this is a “top down” shawl, traditionally done in garter stitch. You may wish to knit a small one to use as a scarf or neck warmer, or a full sized one to wear in the traditional way. The only special technique that you need is to “increase one” which I do with a yarn over, although if you are a beginning knitter the tab cast on is a bit fussy. Cast on 3 stitches, Knit 8 rows. Keeping work on your needle, turn it and pickup 4 stitches between the ridges. Turn the work again, and pick up 3 stitches from the beginning of the tab. You have 10 stitches on your needle. Alternatively, you can cast on 9 stitches, although it makes the top back of the shawl a bit tight. Row 1: Knit 3, yarn over (yo), *k2, yo* three times, k 3. Repeat rows 3 and 4. This “recipe” gives you three stitches on the edge for a border and 2 for the spine, although you can alter that. Keep going until the shawl is as small or large as you wish. If you wish to, a good “rule of thumb” from a Danish shawl knitter is to make one of the “arms” (the equal sides opposite the hypotenuse) of the triangle almost as long as your “wingspan” from fingertip to fingertip, including any border. (I.e., stretch your arms out and measure tip to tip). Yes, it’s a big project! Once you have knit as long as you wish, you will bind off. Here is one option for a sort of picot lace treatment that is done with the bind off. It makes a loose picot edge that won’t be tight as you wrap it around yourself. Binding off: starting on the right side, *knit two stitches. Slip the 1st stitch over the 2nd. Place the stitch on the right hand needle back onto the left. Repeat from * until you come to the last stitch, cut the yarn, pull the end through and weave the end in. For shawl finishing, I usually soak it for an hour in wool wash, rinse and lay it out flat. To get it perfectly even you can use blocking wires but this is optional. Wendy Avery is a knitter, spinner, triloom weaver, dyer, and fiber traveller. She lives in Bluffton SC and is a devoted member of the Fiber Guild of the Savannahs. She blogs at spinsjal.blogspot.com.